Most talented and experienced cooks know that a recipe is fundamentally a starting point for establishing the baseline to a particular dish. While the formula may appear to be set, almost everyone realizes that creativity may often lead to surprising, beneficial and tasty new outcomes. Intrinsic to fine cooking is the acquisition of fine ingredients, a matter of course these days. Such recipe tinkerings or enhancement approaches are not limited to culinary delights, however, and certainly audio designers, among others, have taken good advantage of similar pursuits. Our dish du jour is a highly modified Denon DVP-3910 universal disc player which is a prime example of how creative designers labor to fine-tune an already well executed piece of gear, taking it to new heights. Walter Liederman aka Underwoodwally is well known in the audio industry for a variety of roles and accomplishments in the retail world. From his present Georgia business operation, he has far-reaching collaborations which have served well in bringing a number of experts together in modification projects at many levels, on a diverse range of both cost-effective and exotic gear. The Canadian firm Parts ConneXion is one of those partners and the disc player being evaluated here has been elevated to a degree of excellence that demonstrates intelligence, creativeness and a willingness to push the envelope. While a previously Underwood-modded version of the 3910 is available, the unit currently under review now reflects significant further enhancements, thus renaming the player as the Underwood HiFi Denon DVD-3910 Ultimate. Walter and his colleagues have much to be proud about with this delicious offering. Underwood sells the DVP-3910 Ultimate with varied levels of modifications, which can be purchased either as a completed package, in steps, or retrofitted to an already owned unit based upon the owner's desires. While the nature of each level of modification is very detailed, I'll present some of the high points here and recommend a visit to their website for further information about the subtle alterations. 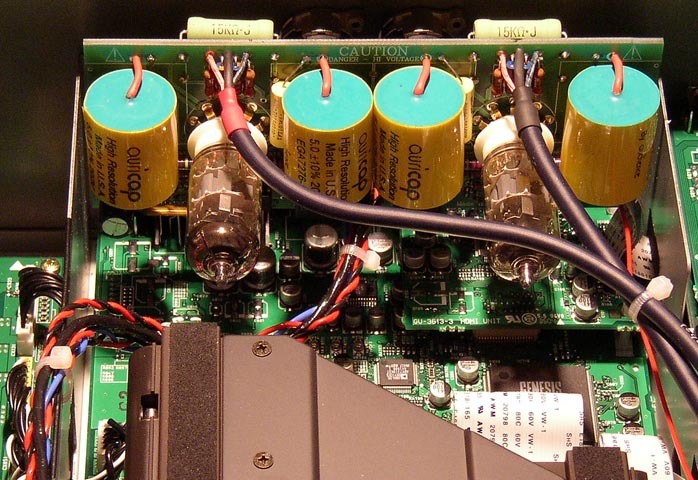 The most intense circuit change creates a fully balanced tube output stage. This effort required over a year to complete and Chris Johnson, who heads up Parts ConneXion -- he was the founder and former president of Sonic Frontiers -- spearheaded the complex work in conjunction with designers Glenn Dolick and Zdenko Zivkovic, along with input from Walter. Interestingly, the factory DACs are internally already fully balanced but operated in single-ended fashion via op amps as the units leave Denon. Getting top notch performance meant putting much energy toward locking in tube-buffered fully balanced operation. This mod is achieved on only the two front channels of the player due to physical space constraints but Underwood HiFi is able to optionally add their established solid-state Level-2 mod to the remaining four channels. 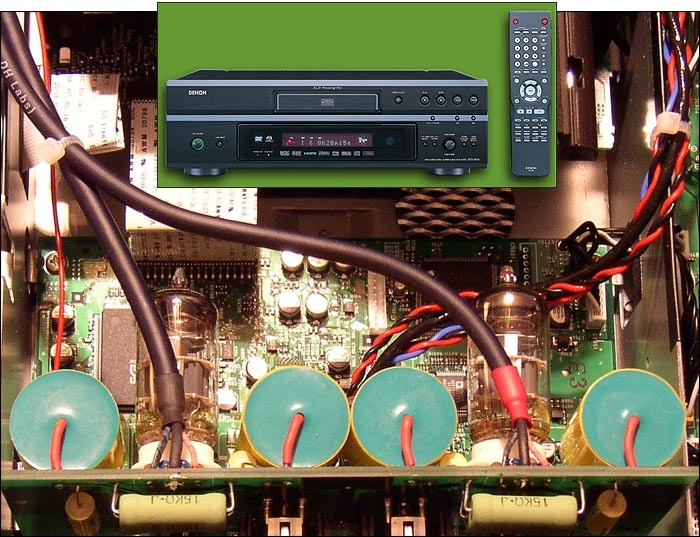 The Ultimate is able to play Redbook CDs, DVD-A and SACD along with CDRs and mp3 encoded music (if one considers the latter an absolute necessity). The website provides many more details about all of this refinement work, but for the sake of time and space I will go on to only a few more of the mod concepts. Op amps receive significant upgrading in many applications and the liberal replacement of important resistors, capacitors and wiring with the highest quality alternatives is par for the course in the Ultimate. Resonance damping, vibration control and air flow considerations are attentively addressed as well. The review unit arrived with the full array of treatments which included the optional addition of a pair of Bybee Slipstream Quantum Purifiers to the power supply. The finished product naturally utilizes a pair of XLR connectors to permit the fully balanced output to interface with a suitable preamp or line stage and an IEC power cord fitting allows for the easy use of after-market AC cords but standard RCA outputs are supplied as well to help interface the player with any preamp or integrated. The fit and finish, while largely inherent from the Denon implementation, is first class and everything, including the mod features, comes across as mature, serious and valuable. Upon arrival, the Ultimate was connected to my sound system and auditioned briefly. From the get-go, it was clear that its performance was at a high level and there were no unusual operational issues to fret over. 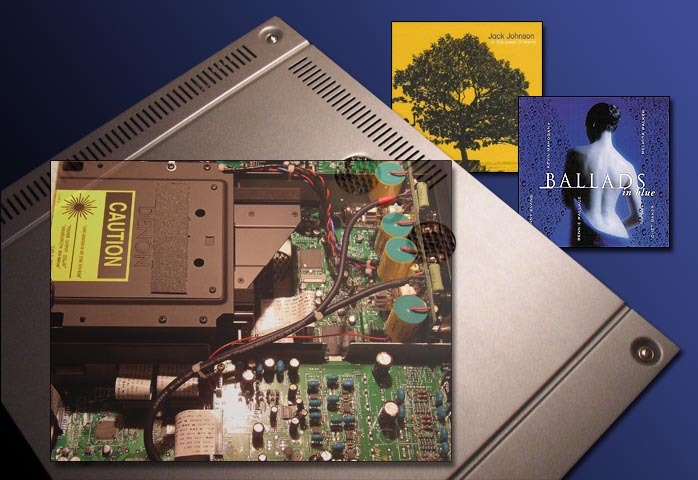 To assure that things would be settled in properly, the machine was given several days of 12 hour repeat-play burn-in using several different CDs. While the top surface of the player in the vicinity of the mesh-covered chassis holes venting the tubes ran warm to the touch, there was nothing more than the expected amount of heat. Clearly this area is not meant to be blocked or covered up but that goes without saying. Serious auditioning began with a compilation disc I carefully generated containing very familiar material from commercial releases as well as several excerpts of live performances I recorded on my own. The first impression was that this music felt expansive, smooth and balanced in tonal range, dynamics and drive. 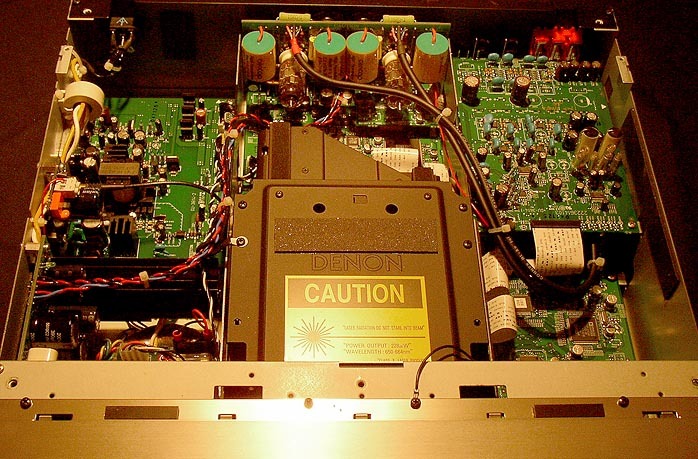 Having owned a Naim CD2 player for several years, the famous PRaT characteristics which that maker is noted for is usually the first thing one explores to see if it manifests differently in gear from other designers. While the Ultimate happily held its own in that department, it additionally brought more to the table than might be expected. The sense of overall ease portrayed now was a bonus that allowed for extended listening sessions even at higher than usual volume levels. While it is not my consistent habit to blast away unreasonably loudly, the Ultimate made it possible to do some of the "demo-style" show-off routines for visiting audio friends without worrying about peeling paint or annoying the nearby wildlife. In addition and in contrast to that finding, it is noteworthy to mention that late night low volume listening felt natural, satisfying and pleasantly enriched via this player. Sweet!